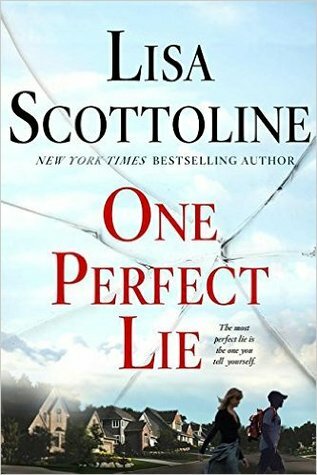 Today I'm featuring my current read, One Perfect Lie by Lisa Scottoline. The excerpts shared are from a hardcover edition I borrowed from the library. Beginning: Chris Brennan was applying for a teaching job at Central Valley High School, but he was a fraud. His resume was fake, and his identity completely phony. So far he'd fooled the personnel director, the assistant principal, and the chairperson of the Social Studies Department. This morning was his final interview, with the principal, Dr. Wendy McElroy. It was make-or-break. Page 56: "Jordan said nothing, trailing him. The gym was filled with the activity and noise of fifty boys running, drilling, and catching." My thoughts: The opening really grabbed my attention and has me curious. I've read several of Scottoline's novels over the years and find her to be a masterful storyteller. Her plots engage from the very start and tend to be page turners. This one so far is true to form. From Goodreads: On paper, Chris Brennan looks perfect. He's applying for a job as a high school government teacher, he's ready to step in as an assistant baseball coach, and his references are impeccable.